Santa Cruz de La Palma used to have a shipyard. One of the largest ships they built was La Verdad, 485 tons displacement, which was wrecked on a reef south of Bermuda shortly after a hurricane in 1899. Luckily the water was shallow and the crew, cargo and bell were saved, although the first mate apparently had a terrible job to persuade the captain to leave. Thomas Cox, a retired sailor from Maine, bought the bell as a decoration for his office. He liked the name, “The Truth”, which is what he was after in his work. Forty years later, when the internet had been invented, he Googled for information on the ship. The only things he could find in English were the Lloyd’s insurance and a little article on my blog, so he emailed me asking for more. I referred him to the naval museum here, not knowing at the time that the museum director is a granddaughter of the engineer who built La Verdad. Long story short, Thomas Cox is donating the bell to the museum! It’s much too heavy to put on a plane, so it’s had a long, roundabout journey by sea and after many delays is now sitting on a new copy of Columbus’s Santa Maria in (I think) Huelva. It’s been delayed yet again, this time by a storm. Meanwhile Thomas Cox is arrived on Tuesday, and we want to show him some pretty good hospitality on a tiny budget. 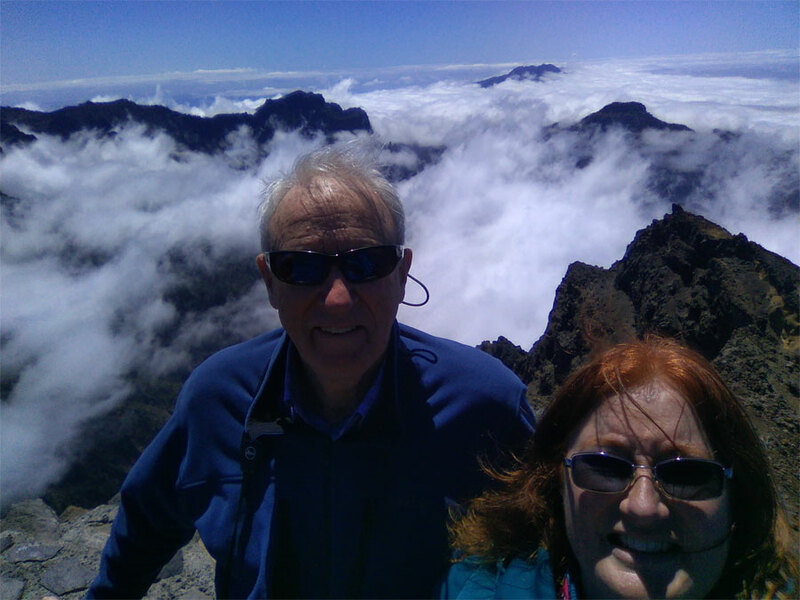 I showed him the observatory on Wednesday and we hiked from the Roque itself to the Espigon with its fantastic view of the Caldera. 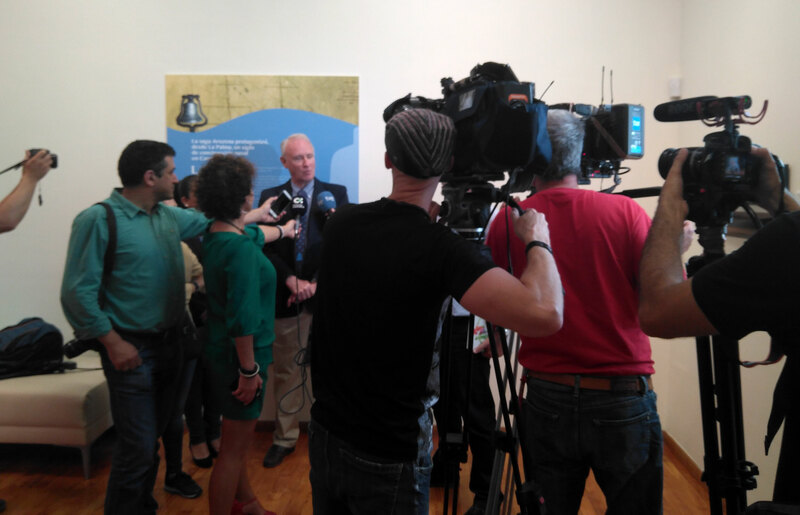 Meanwhile, the special exhibition on the bell opened on Thursday (it’s in the Bajada museum). 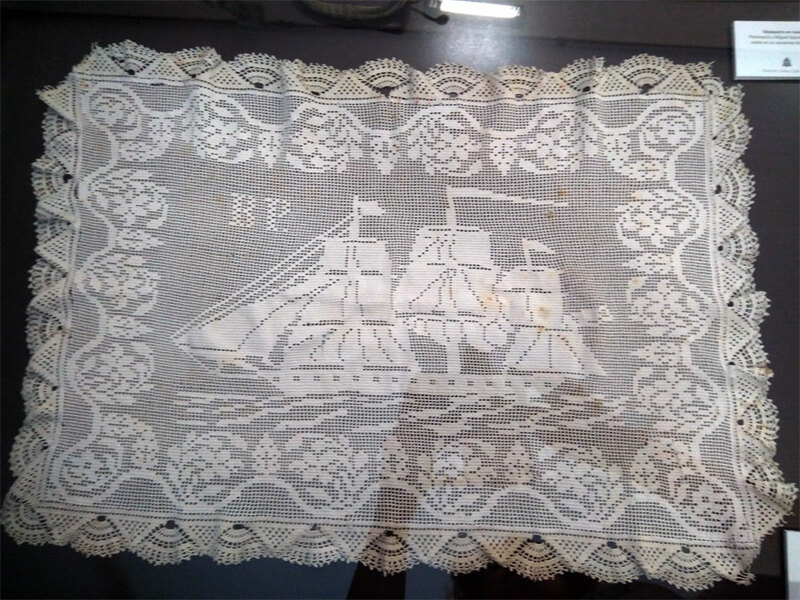 They have all sorts of things, including this crochet of the ship from the captain’s cabin. So I’m pleased to have had a hand in doing something nice for my adopted island. It’s just a shame that Thomas will have to leave before the bell arrives. I agree it’s a shame he’ll be gone before the bell gets there, but it’s rather appropriate that it’s had a difficult journey back home.